When visiting New Zealand it can be easy to head straight to the major tourist spots, but one of the most charming traits of New Zealand is that just about everywhere is stunning. 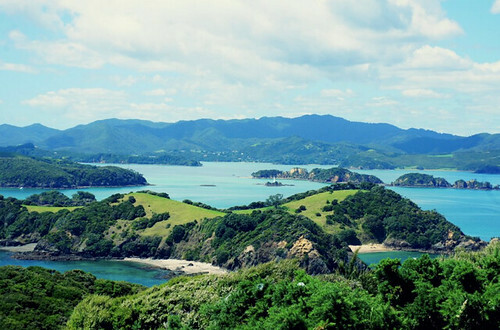 Elle-Rose Williams explores the Bay of Islands. I’d been living in Queenstown, on New Zealand’s South Island for a few months and decided to head up to the North Island to see what there it had to offer. 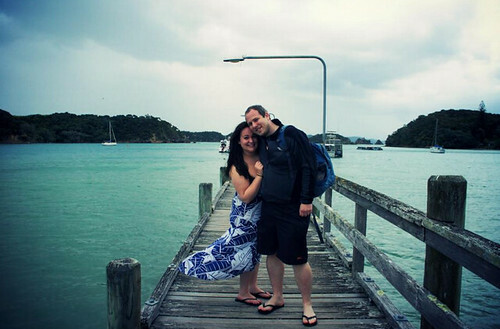 It was a quick flight from Queenstown to Auckland, and then we rented a car and drove ourselves to Bay of Islands. I’ll be honest: I’m a terrible map-reader and was adamant on getting sat nav, but we didn’t need it. It’s pretty much one straight line up to the Bay of Islands – easy to navigate for even the most useless map reader (read: me). The drive took about three hours, and offers some incredible views and plenty of photo opportunities. The North Island is hugely different to the South Island, and you’ll really notice it on this journey. The best way I can think to describe it would be that the North Island resembles Hobbiton in Lord of the Rings – rolling green hills and grassy land – whereas the South Island more resembles the epic landscapes of Mordor, with mountains and sheer drops and unpredictable weather. We spent our time in a town called Paihia (pronounced Pie-here we’re told), a small town but definitely the main tourist hub of Bay of Islands. The nice thing about Paihia is the sheer variety of accommodation. There is something for every budget here, whether you want to save cash in a hostel or campsite, take the middle-road in a motel, or splash out on a hotel or serviced apartments. We decided to stay at the Copthorne Hotel, located on the outskirts of town. 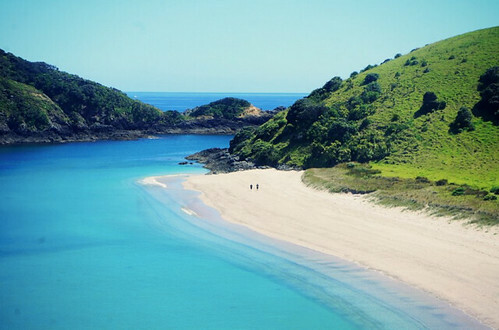 We mainly chose it because we wanted a nice hotel with a pool (Paihia gets pretty hot in the summer) and we wanted it to feel like a proper holiday. This was high on my travel wish list and Paihia is a great place to go dolphin spotting, so we deciding this is where we’d try it out. We boarded a little boat and headed out into the islands. It was a while before we spotted anything, but when did it was just magical. 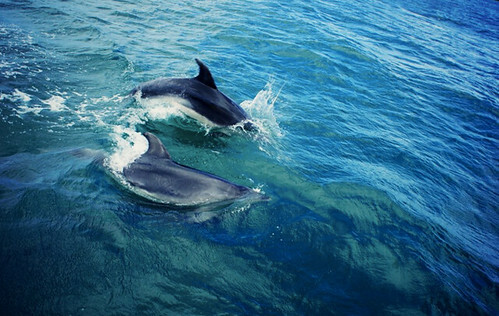 It’s one thing seeing dolphins in an aquarium, but seeing them in the wild is just something else. They came so close to the boat and had it been a calmer day, we would have been invited to swim with them too. 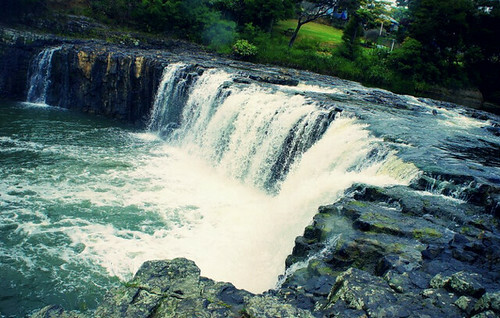 If you’ve got a car, I’d recommend driving the rustic route through to Haruru Falls. You can drive through the countryside also little dirt roads to get there and for a few moments you’ll feel like a real adventurer! The waterfall is gorgeous, not huge (if you’ve been to Niagara Falls) but still pretty awe inspiring. This was a really eye-opening experience for me, and something I’d definitely recommend to anyone visiting Paihia. It’s a relatively small fee to get in, especially for what you learn when you’re in there and the amazing historical items you get to engage with. If you want to learn more about the historical context and culture of New Zealand, you’ll love it here. There is a traditional showcase in the treaty room, and there are all sorts of beautiful buildings and items to see too. One of the Maori war boats really took my breath away, the sheer detail and size of it was phenomenal! We had fish and chips at the local chippy (housed in a big traditional pirate-style ship – it’s hard to miss) and it literally was the very best fish and chips I’ve ever had. So I had to finish this list with that. Of course! If you want to read more of Elle’s adventures in New Zealand and Australia, check out her blog The World and Then Some for loads of travel inspiration. If you'd like to visit New Zealand, take a look at our New Zealand sale with huge savings on flights, holidays and adventure tours.